Please send your files as PDF, JPEG or TIFF in CMYK and allow 3mm bleed. All picture files should have a minimum resolution of 300dpi at actual size and be flattened to the background layer only. All fonts used must be embedded in your document or converted to outlines. You can add bleed when you are setting up a new document. To make sure that your artwork trims without any white lines around it, all artwork should be supplied with 3mm bleed. Bleed is the part of the artwork that continues beyond the edges of the required size. For example, artwork for a business card (85mm x 55mm) that has a background image or solid colour should be supplied at 91mm x 61mm including bleed. If you are creating your artwork in QuarkXpress, Adobe InDesign or Illustrator, you can set up your card artwork to the correct size and make the picture box that contains the background to this increased size and position it correctly. 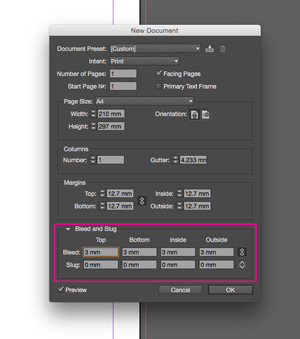 When you export your file to PDF you will be able to specify the bleed amount and include crop marks. We also recommend that you do not put any of your text within 2mm of the inside edge of the artwork, this ensures that no important text is too close to the edge when the artwork is trimmed to the correct size. For further information please look at our blog post on bleed for further information. We can print individual pages single or double sided, for folded items please consider the page size when folded. Our minimum page width when folded is 74mm. If you are planning a multiple page document that needs to be bound, the total page count must be a multiple of 4. You may have to include blank pages. For flat items with multiple pages, please supply them as individual pages with bleed and crop marks. For folded items such as flyers and leaflets, please supply flat as front and reverse pages. For multiple pages that need binding, like a booklet, please supply individual pages for the inner pages and spreads for the inner and outer cover, with bleed and crop marks on each piece of artwork. Please see the relevant fact sheet for each product or if you have any further questions, please do not hesitate in calling or emailing us. When binding multiple page jobs, please bear in mind the offset of the page. Where a large number of pages are included in a staple bound document, the weight of paper can effect how the edge of the document trims. For perfect bound documents please consider images that span across a spread. Offsetting your images in the spine of the document can ensure that none of the image is lost. To prevent breakup of fine lines, they should not have a thickness of less than 0.25pt and fonts should not be supplied at less than 5pt. For large or complicated artworks such as posters with a greater number of paths, transparencies and image trimmings, please ensure that all images are flattened in their original application. Please supply these files as images wherever possible or ensure that transparency flattening is turned on in the application that you use to create your PDF. Overly complicated files can cause errors when processing or printing. When creating folders, please create your artwork within a rectangle that encompasses all of the folds, flaps and bleed when the artwork is flat. Also ensure that a separate file showing exact outlines and placement of folds is also supplied. For folders that are to be printed double sided, the artwork outline must be mirrored for the reverse side. For help in setting up your artwork please give us a call or see our artwork guides. Please ensure that your artwork is set up as CMYK unless you require special colours. Special colours such as Pantone colours can be printed but must be set up correctly as a separate colour channel. If you are printing a metallic colour, only 100% inking of this colour will achieve the desired effect. When printing onto uncoated paper, ink brilliance is reduced, especially with metallic colours as more ink soaks into the paper compared to coated paper. If you have any queries regarding preparation of your artwork, just email us here. It will save you time and money if your artwork is set up correctly from the outset, rather than being disappointed with the outcome or having to reprint. Wherever possible, if there are technical issues with your file, we will tell you before printing them. We must assume that all files supplied in a print ready format are correct. We can take no responsibility for errors in content, image resolution or setup.